I write about plate tectonics. I eagerly jumped from my news feed to the story: “License Plate Tectonics” after I read the headline. About time, I thought. We license everything else – hunting, fishing, driving, marriage. Why not license plate tectonics? There must be some money in it for the government. Make magma pay. License plate tectonics. When the story opened up on my computer screen, I slowly realized that I had fallen for click bait. Bait obviously intended to trick thousands of geophysicists into cranking up the Richmond Times Dispatch’s rank on search engines. I am not going to go into a lengthy discussion on clarity of writing and honesty of intent (after all, it’s the internet that we are talking about); nor will I speculate about what Steve Pinker might write about the curse of knowledge and how it relates to this story. 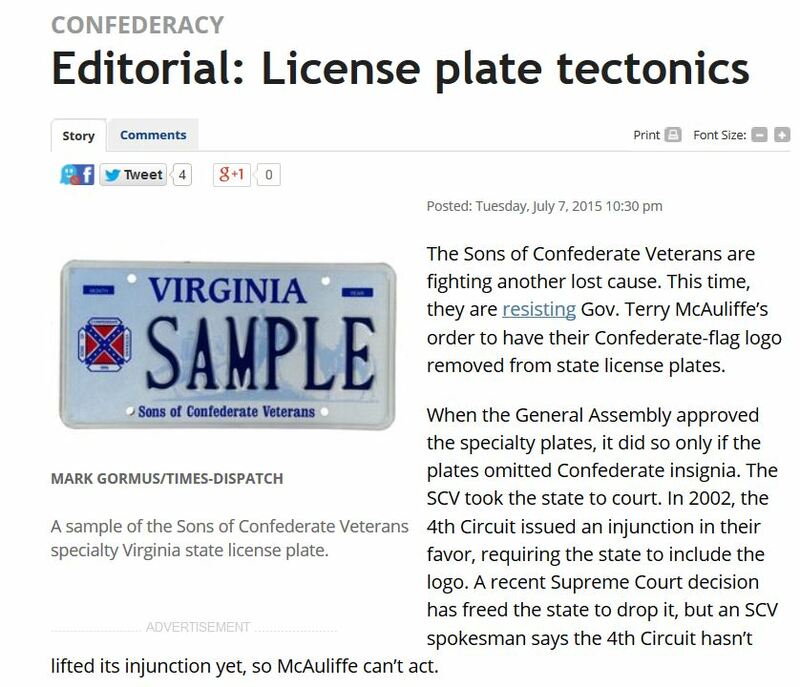 But I will continue to lament my disappointment – for both the lack of tectonic stories in the newspaper and for the persistence of Confederate symbols on Virginia licence tags, which is what the piece was really about. This entry was posted in Culture, Plate Tectonics and tagged licence v license, Virginia. Bookmark the permalink. I think it’s a fair journalistic pun, not deceptive. Plate tectonics doesn’t need licensing, any more than gravity. On the merits, the State needs to act; people should be free (short of inciting violence) to express hateful views, but Governments should not provide them with the platform to do so. Humour me Paul, mine is not a serious story. By the way, your book (From Stars To Stalagmites) arrived from Amazon yesterday. Looking forward to reading it!